What do fleas look like? If you've never seen one before, you'd be forgiven for asking that question, and even if you have, I bet you've never seen one in such detail as the photo shown below! This close up of a dog flea looks like something out of a horror movie; he's a scary little bloodsucker! You certainly don't want them crawling through your Cocker Spaniel's coat, never mind using your sofa or your carpets as a playground! So, what do fleas look like? Take a good look at this close up of one of these blood-sucking parasites...pretty scary huh? Adult dog fleas are between 1 to 4 mm long and are black or dark brown, although after feeding on blood, they swell up and turn a darker reddish-brown. These parasites are very small, but can be seen by the naked eye, although not in any real detail. The flea's body is compressed at each side, making it very thin, and if you look closely you'll see that there are hair-like bristles on its body and legs. It's these bristles (and it's body shape) which help it to travel through your Cocker's coat so easily and quickly. They May Be Small But They Bite! They have piercing, sucking mouth-parts with sword-shaped mandibles to allow them to pierce the skin and feed on blood. Their saliva contains an anti-coagulant enzyme that softens the host's skin to allow the flea to penetrate the skin easily and begin to feed. It's this enzyme that causes allergic reactions such as lumps, redness, and itching of the skin. Usually, the first sign that your dog has fleas will be his perpetual scratching, biting, and nibbling at his fur. Dog fleas may be wingless insects but their sturdy hind legs are relatively large allowing the flea to jump distances of up to 35 cm. They don't need your Cocker Spaniel in order to travel around your home, all they need to do is jump to it! They're very fast and can sometimes jump too quickly for the human eye to follow, but if you do manage to catch one, their polished bodies are able to withstand great pressure making them difficult to squash with your fingers - even if you are brave enough! You can, however, usually break the shell-like body by squashing them between your thumbnails. Although getting the flea into position is not as easy as it sounds, but it can be done. Always wash your hands with antibacterial hand-wash after handling any type of parasite. I hope I've answered your question ("What do fleas look like") and you are now able to identify a dog flea should your Cocker Spaniel inadvertently bring home some of those unwelcome guests. If you check your Cocker Spaniel as often as you have time and you use a suitable flea prevention treatment, you should be able to keep your pet clear of fleas. Just for the record, there's a distinct difference between a dog flea and a dog tick; they are two entirely different parasites. 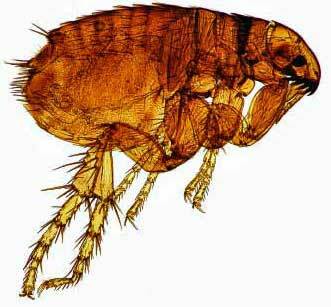 Dog fleas are small, wingless parasites that feed on the blood of your dog, but they can also feed on humans too!